Comments: From 'Hot Space' European tour 1982. It's the first pro-bootleg of this show, As far as I know. I'm not sure of the sound quality, but I guess around very good to excellent. Keyboard by Morgan Fisher (ex. Mott The Hoople), wrong info on cover says keyboard by Fred Mandel. Mandel did the American & Japanese '82 tour. A valuable treasure emerges from “HOT SPACE TOUR 1982” where the greatest performances are fascinated. 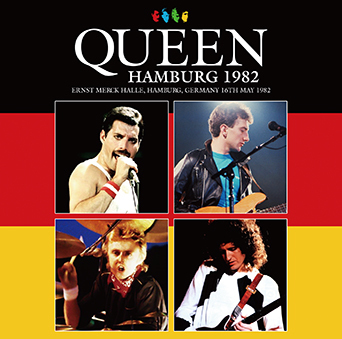 It is recorded in this work “Hamburg performance on May 16, 1982”. It is a realistic audience recording that can be set up on the scene. Speaking of “HOT SPACE TOUR”, memories of Seibu baseball stadium are nostalgic too, but first let’s check the position of the show with the whole tour image including that. Over all 69 shows. Japan was the final stage of the tour in the fall, but Europe was half a year ago. 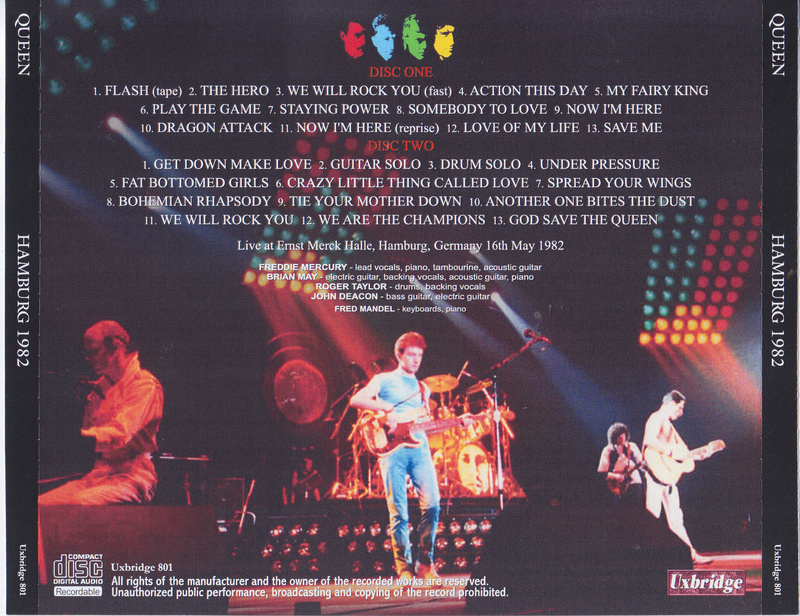 The Hamburg performance of this work was a concert that was the 18th show which is five days before the release of “HOT SPACE”. This work recorded in such a show is a tasty vintage audience that is known only to maniacs. It is not a type that is touted as “a sound board” or “tour masterpiece”, but it is never a type of roar or explosion, even a type that searches for songs in a booba. Although the distance feels a little, the core of the singing voice is plenty to respond strongly, the piano is confirmed until the touch. Audiences and noises are fewer than anything, Freddie’s singing voice does not give a dignified leader. Although it is a favorite because of the weak feeling when listening, it is a favorite recording of a type that understands the goodness of recording itself if it is a mania. Tapes with intense noises were also circulating among traders, but this work is a glossy best master that will be the highest peak. The biggest point of this work which will be more than such a sound is QUEEN which is a top quality buttress. The 1982 European tour showed a splendid show of great results. I’ve reported in a masterpiece group such as “LONG LIFE TO THE QUEEN (Wardour – 113)”, “FRANKFURT 1982 (Wardour – 188)” “VIENNA 1982 (Wardour – 187)” “WURZBURG 1982 (Uxbridge 781)” , Hamburg performance of this work is no exception. Freddie’s voice grew in growth, and Brian knows best is also good. You can do such an amazing show everyday on a consecutive night … and it is wonderful that even Tameus can leak out. Although I could listen to other masterpieces for the first time in a masterpiece, this work is not over. First of all surprisingly after “Action This Day”. Freddie ‘s fairly piano flashed out is my debut work “My Fairy King”! The audience at the work site also did not know the song for a moment, it became turbulent, but gradually the clapping became bigger and it quickly changed to the introduction of “Play The Game”. The cheers also explode greatly. The same thing happens in “Now I’m Here”. This intro is Brian, but the phrase that was struck was “It’s Late.” It is exhilarating here that “Now I’m Here” breaks clapping hand claps. The third mischief (?) Is “Bohemian Rhapsody” at the end of the show. It’s “Spread Your Wings” that begins here primarily. I was doing the same thing at Seibu baseball stadium, but on this day I made a mistake in “Spread Your Wings” and the performance was confused. In the midst of becoming Gudaguda, we start “Bohemian Rhapsody”. Three times never decided three times, but it is only when you put in such plenty of plenty rides. The premature mood in Ikaike is a rocking live album all the time. The 3 minutes of the final scene is also a real document / album. Although it is a quality for somewhat mania, originally a mania is a person who has an eye strength that can see the essence. I simply do not look for poor quality objects and love just the gems that are lurking behind them. This work is a secret treasure loved by such mania. Please, please enjoy this opportunity carefully.